Manchester United and Manchester City are both being linked with an interest in the transfer of Inter Milan defender Milan Skriniar. The Slovakia international looks one of Europe’s top centre-backs at the moment, and has long been linked with a move to a bigger club. And according to Calciomercato, the Manchester giants can sign Skriniar this summer if they meet Inter’s asking price of £85million. In this market that doesn’t look like a bad price, and one that should be perfectly affordable for clubs like United and City. By comparison, there’s talk of Kalidou Koulibaly moving for around £130m this summer, or Raphael Varane for around £100m. Skriniar could easily end up costing more in the near future, so United and City should definitely try their luck with a bid this summer. 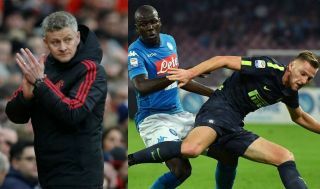 The Red Devils have been tracking the 24-year-old for some time now and urgently need a new world class centre-back.